Anish is a woman some call “The Ghost” because she frequently hikes at night. Here’s the thing: Anish hiked the entire Appalachian Trail in 54 days. She hiked the PCT in 60 days. That means she averaged 42 miles a day and 44 miles a day respectively. And, she did both “unsupported” meaning there were no hot meals waiting for her in camp and probably zero “zero days”. Not only does she “frequently” hike at night, she most likely hikes every night. Here is the text Brian sent me: “This lady just did our hike… 54 days in a row!”. This is the backdrop as I am writing this summary of our own epic hike. Three days ago, a young woman completed 54 days of hiking that we barely survived through one day. Total Elevation Gain: 11,924 ft.
Brian kept much better records than me and his post on www.leconte24.com has a lot of excellent detail. Having done this hike 4 years ago, we have some comparisons to make. The first hike was completed in 22 hours. Our justification for the original route was to hike down the longest climbs. An hour and a half was spent in shuttling from Alum Cave to Greenbriar; a technicality we fixed this time by changing the route. We also took much shorter breaks between segments; typically 30 minutes or less. In fact, our shuttle from Alum Cave to Newfound Gap was only 30 minutes complete. Another subtle difference is that this year, we went ahead and did the Brushy Mtn. summit, which is a 0.4 mile spur trail from the junction for Trillium Gap and Brushy Mtn. We passed it the first time because it was not technically an approach trail up Mt. Leconte. The ramification for me was that four years later I had to go back and hike it to complete my 900 miler; a twist that required an 18 mile hike to snag 0.4 miles. Brian agreed to go ahead and grab this section with me. The 0.8 mile roundtrip took about 22 minutes so if we adjust for that, the “official” LeConte24 – 2015 hike was 45.6 miles in 19:10, 2 hours and 50 minutes faster than 2011. View from the summit of Brushy Mtn. 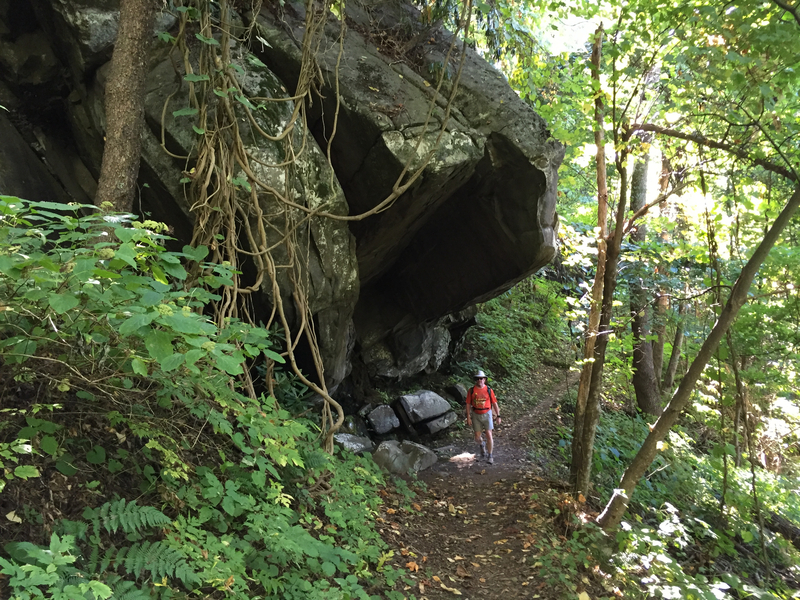 Up AT to Boulevard – Down Trillium Gap/ Brushy Mtn. It was the shortest possible shuttle time and it minimized the total elevation gain. We did not seem to suffer from taking shorter breaks. Usually we would stop at the top for 15 – 20 minutes to eat something. At the bottom, we would eat our “lunches” which for me included peanut butter sandwiches, fruit and chocolate. This strategy worked perfectly until the final segment. We reached the top on the Boulevard Trail around midnight and we elected to continue on down Trillium Gap with no break and no food. By that time, neither of us was very hungry. In fact we both had bouts of nausea and stomach aches. This proved fateful because we both hit the proverbial wall. The last five miles were rather excruciating because we were both completely out of energy and the Advil no longer took the edge off our weary legs and feet. We would have been much better off to force down some nutrition. It will was pretty dumb because we were both carrying plenty of food in our packs. I guess with the finish line in sight coupled with upset stomachs, we both decided to grind through it. Despite all this, we still averaged 2.4 miles per hour at the end. This hike is doable! Brian and I are both above average in fitness level but we are not ultra marathoners (although Brian has recently completed a half Triathlon). The key is steady hydration and plenty of calories throughout the hike. We both carried hydration bladder packs which made it possible to drink constantly. I estimate I consumed about 5 liters of water in addition to 24 oz of Gatorade at each meal. Brian kept a great record of his calorie intake on leconte24.com. If I were to guess, we should have each consumed about 600 more calories on the last segment. I hike mostly solo but I have to say there was a profound benefit to hiking with a partner on this hike. Having great company goes without saying. Especially in the last segment, it was good to have someone to help with pace but more importantly, when you are physically and mentally drained and your vision is drastically curtailed, you stumble a lot (more than usual) and although neither of us had any dangerous moments, the potential to injure yourself in the middle of the night, miles from help is ever present. It took us three vehicles to do this. We left one at Greenbriar where we finished up and drove one to Rainbow Falls Trailhead where we started. We arranged for Brian’s wife Tina to meet us at Alum Cave and shuttle us to Newfound Gap. This was the first time I have used GPS based electronics. 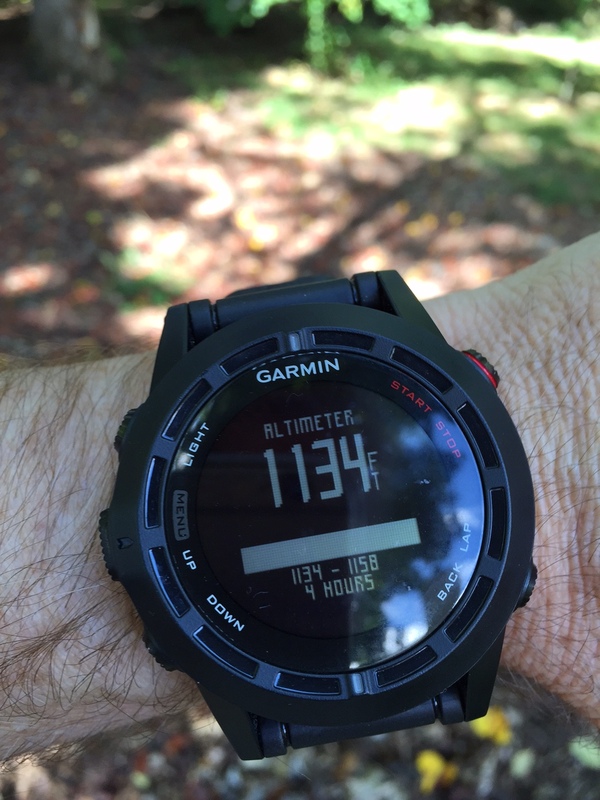 Garmin and others now have pretty powerful GPS systems in a watch configuration. The mapping functions are not as useful during the hike itself as the typical hiking data. I always knew how many miles we were into the segment and the elevation at any given time. This allowed us to manage our pace so we would not blow it all out early in the hike. Both our watches drained completely of battery power before the end of the hike. There are ways to better manage power usage. The data from the watch can be uploaded to a web app and all kinds of data and graphs are available for analysis. Mt. 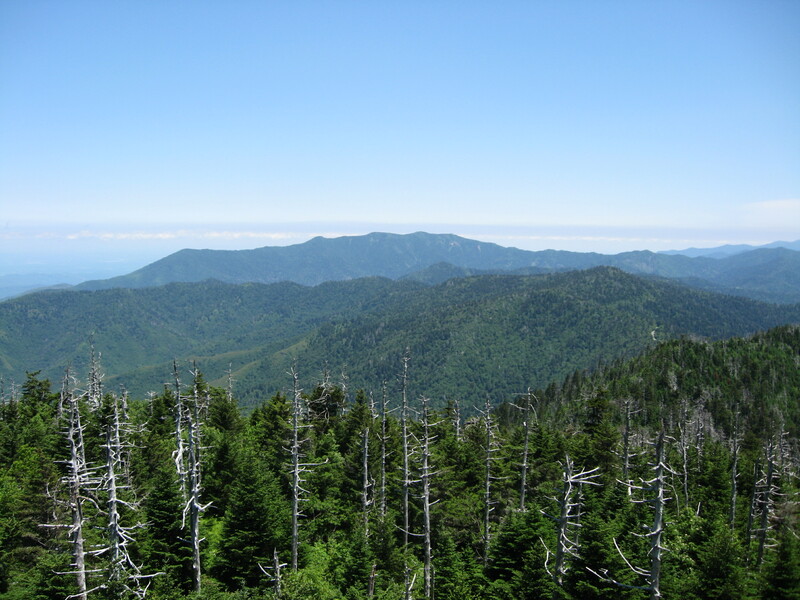 LeConte, at 6,593 ft., is the third highest peak in the Smokies and the 6th highest east of the Mississippi. It is the crown jewel of the Great Smoky Mountain National Park and a prize one has to earn. There are no roads or shuttles or ski lifts. Only feet and horseback. The trails are all well maintained and clearly marked with signs. The ridge is lined with spruces and Douglas Firs giving the smell of Christmas all year long. It is certainly worthy of an epic hike. Thanks to my great friend and brother Brian Thomas who shared this time with me…twice! 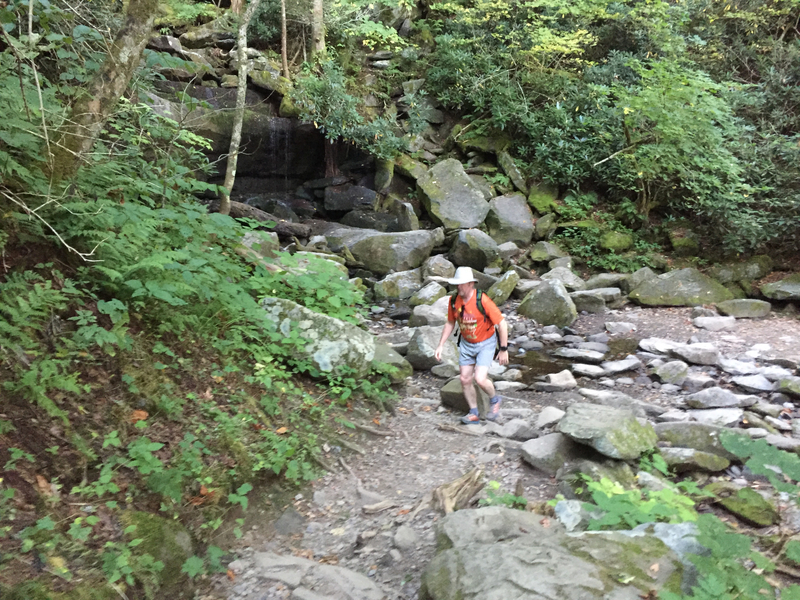 This entry was posted in Trail Log and tagged 900 Miler, Anish, Appalachian Trail, Great Smoky Mountain National Park, LeConte24, Mt. 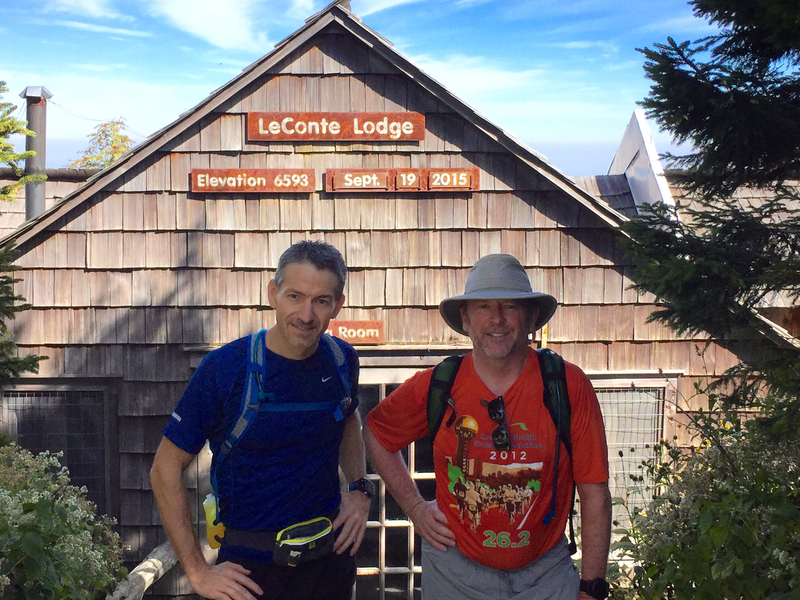 LeConte on September 26, 2015 by blogginggazelle.